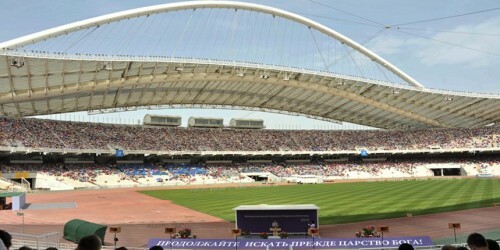 ATHENS, Greece—Jehovah’s Witnesses in Greece hosted the “Keep Seeking First God’s Kingdom!” International Convention at the Olympic Athletic Center of Athens, the site of the 2004 Olympic Games, on June 27-29, 2014. An audience of 35,863 Bible students gathered at the stadium. During select portions of the program, another 3,093 people were tied in by video in Belgium and Cyprus, bringing the total peak attendance to 38,956.